21-Piece Swing Set "Orchestra" Emits Sound and Light as Passersby Play! 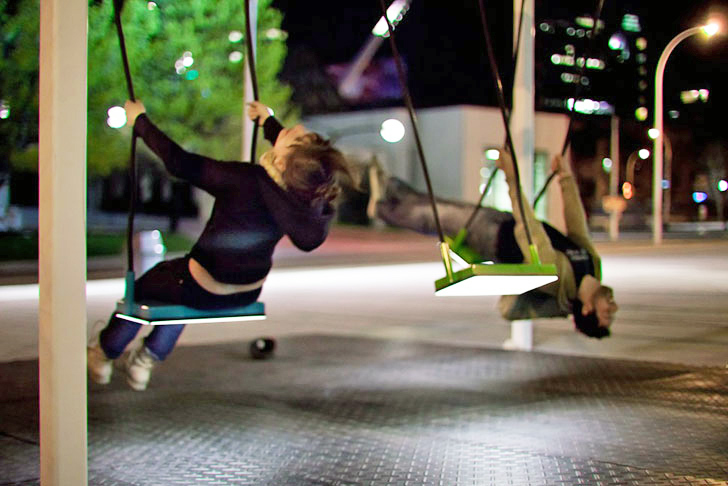 21-Piece Swing Set “Orchestra” Emits Music and Light as Passersby Play! Every spring an interactive installation takes over a busy area in Montreal’s Quartier des Spectacles - and this year it's a giant interactive instrument made from a series of swings! 21 Swings by Daily Tous Les Jours is a series of fiber-optic-linked swings, each of which triggers sounds from a different musical instrument. Local collective Daily Tous Les Jours created this unique interactive space for people to exercise and meet others – and they’re rewarded for their work with musical tunes. Designed for all ages, the 21-piece swing set orchestra includes a piano, a guitar, a vibraphone, a harp, and other instruments that combine to play a musical piece in which certain melodies emerge only through collective cooperation. Designed in collaboration with behavioral ecologist and professor Luc-Alain Giraldeau, 21 Swings explore the concept of cooperation and how individual behavior can depend on group decisions. The innovative design invites people of all ages and backgrounds to get together, creating joy and instilling a sense of ownership of a public space. When the sun goes down the swings light up, evoking a sense of childhood nostalgia in passersby and issuing a powerful invitation to swing and create some tunes. 21-Piece Swing Set "Orchestra" Emits Music and Light as Passersby Play! Local collective Daily Tous Les Jours created this unique interactive space for people to exercise and meet others - and they're rewarded for their work with musical tunes. Designed for all ages, the 21-piece swing set orchestra includes a piano, a guitar, a vibraphone, a harp, and other instruments. The swings combine to play a musical piece in which certain melodies emerge only through collective cooperation. Designed in collaboration with behavioral ecologist and professor Luc-Alain Giraldeau, 21 Swings explore the concept of cooperation and how individual behavior can depend on group decisions. The innovative design invites people of all ages and backgrounds to get together, creating joy and instilling a sense of ownership of a public space. When the sun goes down the swings light up, evoking a sense of childhood nostalgia in passersby and issuing a powerful invitation to swing and create some tunes.